1966 Topps Batman A Series, also known as the Red Bat set, is the second of five sets from the franchise to be released that year. It's also the second set to highlight the artwork of Norman Saunders, a hobby legend who also did 1962 Topps Mars Attacks. The 1966 Topps Batman A Series checklist dropped to 44 cards, down from 55 cards in the earlier Black Bat set. Card fronts are nearly identical. The big difference between the two sets is Batman icon on that holds the card's caption. Here, it is red. This set also has a thin red frame around the image. 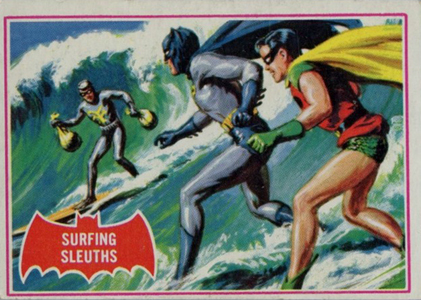 Although there is a short caption, 1966 Topps Batman A Series card backs act primarily as puzzle pieces. A complete set gives collectors ten-piece puzzles of both Batman and Robin, as well as six-piece puzzles of the Joker, the Riddler, Catwoman and the Penguin. The cards take on the tone of the TV show starring Adam West and Burt Ward. Most of the perilous situations the cards show are absurd and much sillier than the pulp-style artwork suggests. From Batman riding underwater on a shark's back to peg-legged pirates to giant snowballs, it's definitely not the dark tone that surrounds the franchise today. I have a bunch of the red Batman cards. I saw your site to find the value of the cards. Some of the cards I have are listed with hefty prices. How do you figure out the price? I have 42A which is listed for $300 on your site. I know mine can not be worth as much because it has a small crease started on one corner. Do you buy them as well? I have no complete puzzles. I am curious to know. Thanks for your time. Rosemary (ID 89815) � The most valuable cards are professionally graded by a company like PSA. They grade cards on a 10-point scale. Those rating a 9 or a 10 for this set are likely to command very high dollars. The ones you saw are simply listed for sale. That’s the seller’s asking price. Harold � This article here: https://www.cardboardconnection.com/comprehensive-guide-card-grading should help get you started. I have 5 full and complete collection (black, red and blue, riddler’s riddle and bat gaffs). In good condition, probably of 5 or 6 on PSA. What do you think it’s the value of the sets ? I have 60 cards…. some doubles and in good condition….. make me an offer….. Thanks! I got Batman, catwomen and riddle. Make me an offer?